Prev The Never-Ending Blended Family Dance Next Single Mom: What About Staying Together for the Kids? 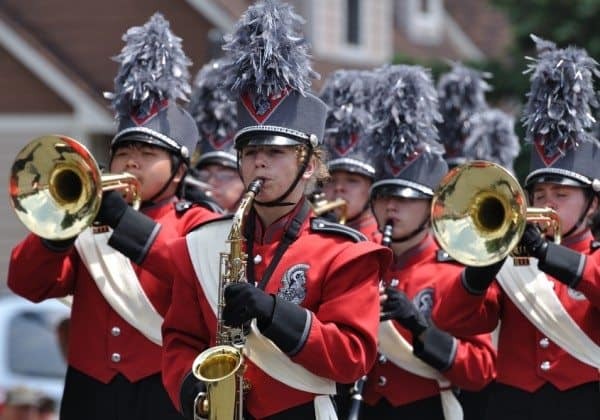 The first piece I ever wrote for Alpha Mom was this one, about why you want your teen in marching band. We were, at the time, relatively new band parents (we’d been through just one marching season). We were also, at that time, in the middle of a very difficult stretch with my teen daughter, who was struggling with a lot of issues and no longer seemed like “herself.” When I’d allow myself—in the midst of that trying and downright scary time—to think back to the last time she’d seemed happy happy and whole, the answer was always the same: Marching band. She’d been most herself during marching season. She was disciplined, focused, and working as hard as we’d ever seen, absolutely, but she was also feeling competent and proud of herself. She was happy. So when I wrote the original piece, I was nostalgic for that brighter time. Maybe, I thought, after turning in my writing, I’d romanticized it, just a little…? My words were colored by longing for a simpler, happier time. Maybe I was giving band too much credit, and really I was just wishing for a time machine. But then the piece went viral, because (surprise!) we are not the only family for whom marching band has been nothing short of amazing. Something magical really does happen there for those kids, and by extension, for families like ours. Kids who’ve never been part of a group find their place. Kids who’ve never mustered the motivation to work hard and push themselves are stretched further than they could’ve imagined possible. Band kids feel good about themselves. If you have teenagers, you know how precious that is. The next band season, my daughter—who’d had such a transformative experience, her first marching year—was a thousand miles away, taking a spin at living with her father, and pretty much the first thing she did at her new school was… drop out of band. What had been worry on my part turned to panic. Reasons were cited; the band director was a jerk! It wasn’t like her old band! She couldn’t keep up and the atmosphere was all wrong and on and on and on. Her stint away felt interminable but ended up short-lived, and she was back at home (and back in the band) just a few months later. The first day of band camp, that summer, I exhaled a breath I hadn’t even realized I’d been holding. She was home. Shortly after the marching season wrapped, that year, my son returned to public schooling, joining his sister at the high school. We let him have plenty of input on his class schedule and plans, but I put band on the roster without discussion. “I’m not sure I want to do band,” he offered up, one day. I made a deal with him: He would try it for the semester and see how it went. If he hated it, he didn’t have to take it the following year. He agreed. The semester concluded, and we went to the marching band sign-up meeting. “I’m not sure I want to do marching band,” he said. I asked him if he’d enjoyed concert band, and he allowed as how he had. I told him the same deal we’d struck before would work again: He would try a season, and if it turned out not to be for him, he wouldn’t do it again. He agreed. We turned in our paperwork. Just before camp started this summer, we had another meeting. At the end of it, people were milling around, catching up with one another, getting music, asking questions of the instructors, etc. My daughter was flitting around doing various things, totally in her element. My husband was helping with some prep task. I was talking to the band director about something. At one point he looked up, stopped talking, then pointed behind me. “What’s he doing?” he asked. I turned to follow his gaze. My son was looping around a tiny section of the hallway in circles. He wasn’t making any noise, or flapping his arms, or doing anything out of the ordinary, really, other than walking in small circles. I never would’ve noted it as odd. “He’s… walking in circles?” I said. My son had been in class with this man for a semester already. My daughter’s been with him for years. I am very fond of him and have a tremendous amount of respect for what he does and how much time and heart he gives to the kids in our program. And at that moment I couldn’t figure out why he was asking me that. So I answered as best I could: “Well, he’s bored. He’s probably tired, and he’s definitely hungry.” To me, the question was now answered, but the director still seemed puzzled. And then I realized what we were actually talking about. “… and he’s autistic, and that’s what he does,” I concluded. “Huh,” he said. “I’ve never seen him do that before, is all.” We returned to our discussion. Band camp began, and this year I’m watching the magic unfold times two. My daughter is back doing what she loves, and my son is getting caught up in the excitement. They’re working hard. They’re loving it. They’re part of a big, supportive group. They’re becoming more themselves, within an organization that constantly challenges them and lifts them up. And oh yeah—I guess there’s some awesome music, too. I’ve said it before and I’ll say it again: Band kids are the best kids, and band directors are saints among us. I will never stop being grateful that my kids have marching band in their lives. Thank you for this article and your other, last year. I teach elementary band and was on staff with our high school marching band for many years. I sent your post to some current staff members. I love how you write, and it was a beautiful post. If it is not too nosy, I would love to know what instruments your kids play. Thank you for showing everyone your family’s perspective on marching band- it’s a great thing to do! But what made me laugh even more is the advertisement I saw below your post about pool problems, brought to you by HCH. Marching band saved our collective lives in High school. Can’t express enough the love and gratitude for all things band and band related. I’ve never been to band camp, but I went on 8 choir tours in 7 years and couldn’t agree with you more. My years spent in choir and going on tour were the best thing ever. They were my social group, best friends, and place to belong. I think this is true of any strong music program. Glad it’s working for both of your kids. My son HATED band!!!! He hated the directors, hated practice, hated the other kids, on and on and on. Life improved 1000% when we just let him quit. My daughter is now in the same band with the same directors, lots of the same kids, same everything and LOVES IT!!!! Band is life! Just remember, no matter how great band is, it’s not going to be for every kid.